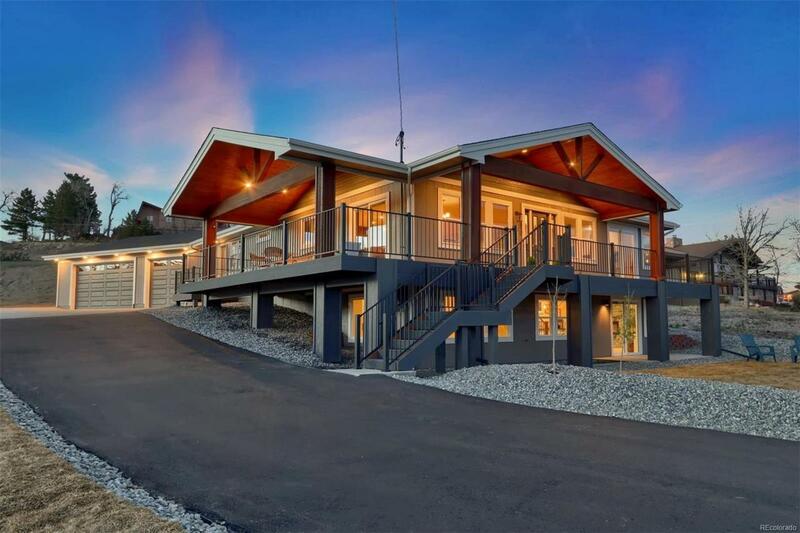 A luxurious, contemporary country home located in one of Arvada's most sought after locations, highlighting: a half acre lot, zoned for horses, stunning panoramic views from Colorado's Rocky Mountains to downtown Denver city scape! This new build includes a covered, wrap-around deck, rustic accents, 5-car garage, walk-out basement, and south-facing driveway! The main level boasts views from every window, hardwood floors throughout, custom kitchen with ample cabinets, large center island, 36" gas cook top, stainless steel appliances, slab granite, and oversized pantry. The master suite boasts patio access, stunning views, custom closets, dual controls in master shower, and designer touches throughout, two, guest bedrooms with jack & jill bath, office with french doors, and main level laundry. The fully finished basement highlights mountain views, second fireplace, wet bar, reading nook, two, guest bedrooms, exercise room, large family room, & all new electrical, plumbing, & HVAC!